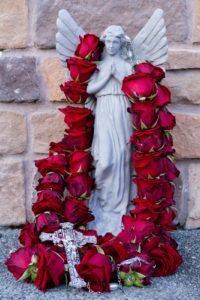 Welcome to the brand new BLOG of FreshRosary.com! If you’ve found this reflection by way of Allison Gingras’ Reconciled to You Blog thank you for visiting!! This post is the first for my blog, and the first in Allison’s series called, “What Does the Catholic Church Really Have to Offer Me?” I hope you enjoy it. Remember to enter Allison’s Giveaway, from her blog, not from mine. There are some sweet prizes that await you. Volumes are written on the Rosary. Surely as I type this blog post, somewhere a brilliant writer is composing a heartfelt story, a compelling exhortation, a historical compilation. All I can do is offer my musings and some of my rosary stories, and hope you’ll find me sincere and believable. Let’s begin by saying I was born and baptized into a Catholic family, with a legacy of devotion that spans centuries, originating in Ireland. My maternal grandmother prayed the rosary so consistently that she wore the edges off of her beads. When did I become aware of the Rosary? I remember handling mom’s bejeweled rosary with childlike awe, enchanted by its shiny, faceted beads, textural metal crucifix, and image of Mother Mary resembling a bracelet charm. Getting into mom’s jewelry always elicited a stern, “hands off,” but not if I wanted to hold her rosary. Why she never rebuffed me and removed it from my tiny fists baffled me. Much later I realized that mother wanted me to form a relationship with the Rosary, and more than materially. The rosary is physical. It’s an arrangement of beads, chain, and a crucifix, with a centerpiece medal most often depicting the Blessed Virgin Mary. Some people think the rosary is jewelry, like I did as a little girl. When ordering rosaries in bulk to include in our FreshRosary.com shipments, I found them listed online as “Rosary Necklace.” My overseas supplier emails me offerings of other types of jewelry – chokers here, bracelets there — amusing, but not enticing. I don’t sell jewelry. I do, however, promote the rosary! People pray it with their hands, hearts, minds, and voices. They read rosary meditations from books. They kneel in churches, sit in living rooms, walk with a rosary in their pockets, pray while driving, pray at hospital bedsides. 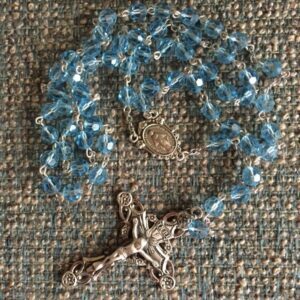 Even without beads, a rosary can be prayed on the fingers. Ten fingers equal a decade. Its physical nature, and repetitive prayers, have led some to believe that the rosary is rote, mindless, meaningless, vain. But “misunderstood,” is more like it. The rosary is mystical. While dying on the cross, “When Jesus therefore saw His mother, and the disciple whom He loved standing nearby, He said to His mother, ‘Woman, behold, your son!’” (John 19:26). With this action, Jesus gave His mother to all of humanity, because Jesus loves all of us. Every time I pray a “Hail Mary,” I am literally asking Jesus’ mother – MY mother! – to pray for me, “now and at the hour of our (my) death.” With a 5-decade rosary, I’m asking her 53 times to remind God of my needs, present and future. What mother would deny her child this favor if they asked her 53 times? Imagine the fruitfulness of asking that many times, every day. 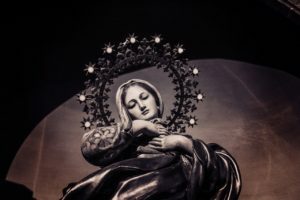 Asking the Heavenly Lady to pray for me, now and at the hour of my death, has pulled me into some unexpected encounters that make no earthly sense. On a flight to California, I sat next to a little old lady whose plaid wool blazer reeked of mothballs. “Bless her heart, and give me patience for this flight,” I selfishly prayed. She got out her rosary and began to finger it silently. For the entire time she prayed, about 45 minutes, I could not smell mothballs, but was overwhelmed by the scent of the most heavenly roses. So much so that I asked a flight attendant, and even another passenger, “Do you smell roses?” Quizzical looks and head shakes were their answer. The rose scent didn’t mask the odor of mothballs, but completely replaced it. My seat mate zipped her rosary back into its pouch, and the strong odor of mothballs returned, as instantly the glorious rose scent vanished. I tried to ask her about it, but English wasn’t her native tongue, and she didn’t savvy my question. Still, I know Our Lady was with her in prayer. 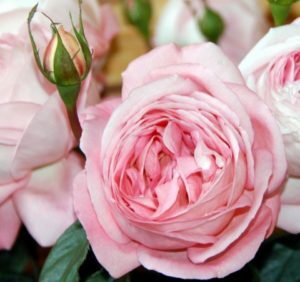 The fragrance of roses has been associated with apparitions of the Blessed Virgin, and is taken as a comforting sign of her mystical presence. At a Catholic women’s retreat many years ago, our group of about 50 had reverently prayed the rosary together in a makeshift chapel. At its conclusion I left the room with my friend, Cindy. As we stood in the retreat center hallway near a window, she held her rosary up to the light, and we watched with surprise as the silver rosary turned metallic gold, like paint were slowly pouring down its length all the way to, and including, the crucifix. I whispered, “Cindy, are you seeing this?” and she affirmed. It was over 20 years ago, and we both remember the event clearly. We saw it together. It really happened. The account of my brother’s holy death is here. We’d just finished praying the rosary at his bedside, and witnessed the physical signs of his soul leaving his body. I’m certain he could see us surrounding him in prayer as he passed on to the next life. I could tell many more stories of answered prayer occurring almost immediately after the conclusion of praying the rosary: A hopeful and positive report from medical staff. An unexpected reprieve from an IRS tax lien. Good news where there had previously been worry or despair. Ask around. If you have friends or family who pray the rosary, I bet they have stories, too. The rosary is timeless. The rosary has a storied past, a vibrant present, and a prophetic future. The history of the rosary can be found online and in books like The Rosary Collector’s Guide, but I believe that it transcends time, because the rosary is more than a physical object. Rather, it accompanies people on their life journeys. Praying the rosary regularly is akin to developing a trusted relationship with the Mother of Jesus, who said, “Behold, I am the servant of the Lord; let it be to me according to your word.” (Luke 1:38) Then as one servant to another, at the wedding feast at Cana (John 2:5), she says, “do whatever He (Jesus) tells you,” Mary is all about serving God, and urging us to do likewise, and she leads by example. Having a relationship with her enhances my relationship with Jesus. It makes me want to love and serve him in a more growing and fruitful way. I like to think of the Rosary as a celestial lasso connecting all of humanity in a circle of love, guided by Christ’s Mother, who wants only to assist her Son by encouraging us into loving service and obedience to God. Now with our recent FreshRosary.com effort, I’m seeing and hearing many new stories of beloved souls, whose love for Our Lord and His Blessed Mother, is well known among friends and family, because the rosary became much more for them than a pretty piece of jewelry. 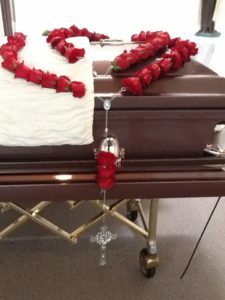 It became a prayer lifeline, accompanying them on their journey to the afterlife. I hope to share more of these stories with you in future blog posts. In the meantime, has the Rosary touched your life, or brought Heaven closer to you in a discernible way? I’d love to hear about it!